Catch Meadow Cottage: Hunting For Maine Lobster.... In The Woods! Hunting For Maine Lobster.... In The Woods! Here in Maine we are so fortunate to have a plethora of seafood available all year long. We regularly enjoy fresh scallops and shrimp right off the boat, mussels, clams and of course the famous and well loved, Maine lobster! However, when September rolls around, we get to enjoy yet another kind of lobster....except this one doesn't come from the sea and isn't so well known. It's the Lobster Mushroom, otherwise known as Hypomyces lactiflurum. 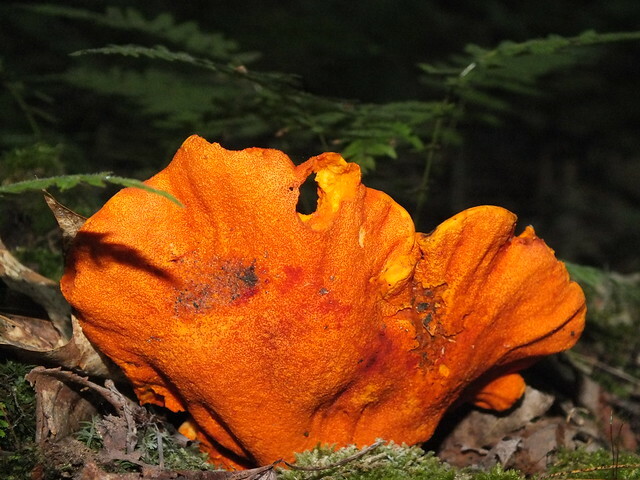 This brightly colored orange spectacle is actually a mold that grows on and over a preceding mushroom. It almost looks like a lobster claw reaching out of the ground when you find it in the woods. You can't miss them. Well, this weekend, when we went for our hike around the Catch Meadow Cottage property, we also hunted for Lobster Mushrooms. They were everywhere on the property. In fact, not much hunting was necessary, it was hard to take a step and not find one. Although they fill the house with a strong seafood-like aroma, I will clean, chop and then dry them in my dehydrator so that we may enjoy them in our soups and stews all winter long. Black Trumpet season is rolling around very soon so I hope they are as plentiful on the land as the Lobster Mushrooms. The Black Trumpet mushrooms are my favorite! After hiking and mushroom hunting, we added the finishing touches to the gate. Round corbels on the posts and black iron hinges and handles complete the look! We have also been working on the beams inside the house. That will be included in my next post. for use of the #1 Lobster Mushroom photo.